Growing up in Florida, I’ve been canoeing a few times, but I’ve never been on a kayak before. Some of my former co-workers used to go kayaking a lot, and I thought I might enjoy that. 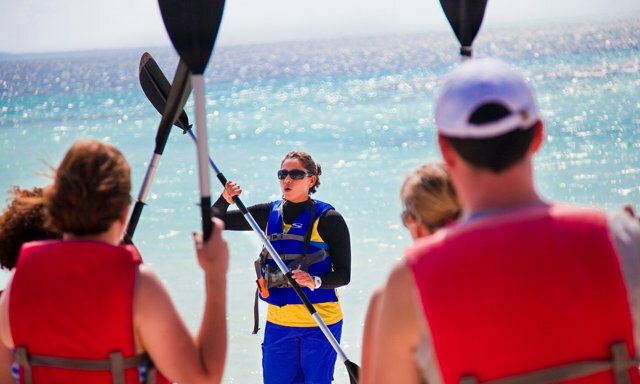 When I saw a Kayak Adventure excursion on Coco Cay, I booked it hoping to find out if kayaking around the Florida mangroves would be something I could spend my weekends doing. I almost don’t want to mention the start of the adventure being the very tedious tender process from ship to Coco Cay. However, I will mention it in the context of Royal Caribbean addressing this low point in the experience. Royal Caribbean is almost done with building a pier large enough to accommodate two ships simultaneously as part of the Perfect Day at Coco Cay project. I enjoyed my time on Coco Cay. Getting me on the island faster will let me enjoy it even more. The tour group met near Coconut Willie’s at a shack set up to rent floats and lockers. I signed the waiver and rented a locker to store my towel and other belongings. Because I registered for the tour by myself, I was given a one-seat kayak while most other people on the tour were given two-seat kayaks. I would be providing all the power and all the steering on my own. After we all donned floatation vests and picked out our paddles, we got some paddling and steering instructions. Our guide also gave us tips on how to get back into the kayak if it flipped. He said with no wind out today, if someone flipped in their kayak, they were trying to flip it. We were ready to drag the kayaks off of the beach and into the water. Now in a kayak for my first time, our tour guide led us out into the shallow water around the beach. The water was surprisingly clear. As we paddled out, we saw the grass growing out of the sandy floor. Our guide encouraged us to reach in and pick up a conch if we saw one. Some people picked up a conch shell that turned out to have a hermit crab inside. I spotted a few fish swimming in a school along with sponges. Once we paddled out farther from shore, our guide got into the water and picked up a small starfish for the group to pass around. A short distance away, we saw a slight disturbance in the otherwise smooth water. We were told it was a shark, but a harmless one — probably a nurse shark. Our guide got back in the water after he spotted a much larger starfish. He picked that one up and passed it around. The outside felt like spiky concrete. I’m surprised the animal can move with a body so hard and seemingly inflexible like that. It was also very heavy for its size, which is probably due to it having such a dense exterior. After getting a ways from shore, all the while still in water that could not have been more than five feet deep, our guide noticed a jellyfish in the water. I looked around and saw a couple of other jellyfish in that area. That one I didn't need to pick up; it could stay in the water. While paddling out to the undeveloped part of Coco Cay, we could see the construction equipment behind some trees that let us know this part of the island would be developed as part of the Perfect Day at Coco Cay project. With almost no wind that day, the water was very smooth and easy to see through, except for one moment when the surface of the water started boiling. We could see little fish coming up to the surface in a frenzy. I joined a couple in a two-person kayak and one of the other solo kayakers paddling like mad out to the disturbance to get a closer look. The fish, or maybe the shark feeding underneath them, must have seen us coming. Once we got within ten feet of the rippling action, it all subsided and the water returned to calm. Approaching the southern tip of the island, we made a turn back to the shore and pulled our kayaks up onto the beach. We all got into the water and relaxed for a bit before getting back in the kayaks. On my way to shore, I spotted a sea urchin next to a rock (another creature I knew better than to pick up). While sitting in the water just a few feet from the beach, a couple of fish swam up to me and investigated the area. They were the largest fish I had seen on the tour, but even they could not have been more than eight inches long. I also spotted a striped fish about an inch and a half long staying in close proximity to the shelter of a rock with a big hole in the side. He let me get pretty close before he’d duck into the hole. Then if I stopped, he swim back out again keeping one side of his body up against the rock. If I took a step, he’d dart back into his hiding place. It was adorable and felt like something out of Finding Nemo. After our rest, we got back into the kayaks and made our way along the shoreline back to our starting point. Our guide called out some stingrays, but they weren't near me. I might have seen the tip of a stingray’s wing, but it was so quick, it may have just been the seagrass moving. I did spot a much slower-moving creature. I looked down to see a sea cucumber plodding along a grassless patch leaving a trail of compressed sand excrement behind him. Our final wildlife encounter was with the least predictable of all the animals in the water — the fellow resort guest. Even seeing a squadron of kayaks approaching, almost no one made any attempt to get out of the way. Two ladies in their 60’s saw me heading towards the beach, then turned their back to me and walked right into my path as I made my wobbly return to shore. I called out “sorry, I don’t really know how to steer this thing.” They looked up and took two steps to the side. I pulled my kayak up to beach, returned my paddle and life vest, and retrieved my towel from the locker. I was pretty beat after an hour or more of paddling, and at that point I just wanted a shower. I’m glad I tried kayaking. When I return to Coco Cay, I might do some other activity so I can experience more of the resort. After the fun I had on the Kayak Adventure, I would kayak again, but I’d prefer to get a second person to join in. When a cruise ship docks at a public port, you have the option of booking excursions through the cruise line or through an independent tour operator. Because Royal Caribbean owns and operates Coco Cay, all the excursions are organized by the cruise line. This means that the Cruise Planner is a one-stop shop for all the excursions and activities at the resort. The Kayak Adventure on its own is $43, but it can be purchased as a Kayak Adventure and Snorkel Combo for $72. If you opt for the combo, when you check in for the Kayak Adventure, you'll be given a wristband. Show that wristband at the snorkel shack after your kayak tour, and you can pick up snorkel equipment to use for the rest of the day. 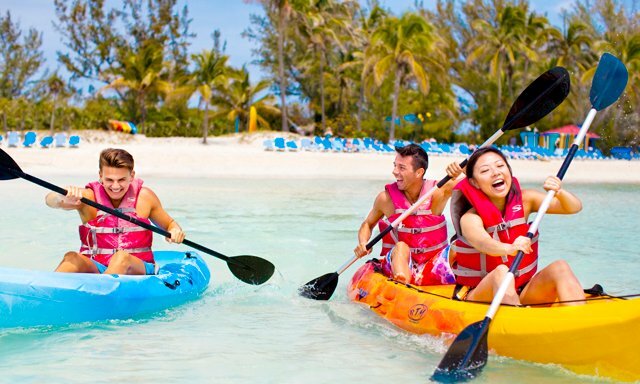 Have you been kayaking on Coco Cay? Have you done any of the other excursions on the island?